Disney Spring icon is almost ready plus new retail stores. The expanded Walt Disney World, Disney Spring formerly Downtown Disney, is day by day reveling more stores that are going to perfect the great offers of what will be the most innovated andtheme shopping plaza in Orlando Florida. With different segments the shopping and entertainment complex will be opening from now on until May 15th and will be around Town Center area. In addition the almost finished construction of the water tower will be the icon and the welcoming of Walt Disney World, Disney Spring. On the gastronomic experience Disney Spring will offer soon D-Luxe Burger, Amorette Patisserie, Tablas Frontera a Mexican Restaurant and Homecoming a Florida Kitchen.has to be visited on your next trip to Orlando Florida, because it is most likely you want a great souvenir or you can book your next trip to Orlando an spend the day in a place that it doesn’t charge for let you in. With Orlando Discount Tickets USA you can book your next trip to Orlando Florida starting at $169 dollars per person and getting 4 days and 3 nights and tickets for the first 2 people for one day in Disney. 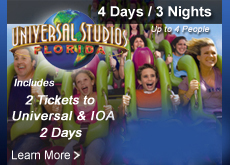 Visit www.orlandodiscountticketsusa.com to discover great offers on hotel and admission for the theme parks. When the Theme Parks are created the is a mix of entertaiment that is for everyone and some other is targeted to create the charm and the diferentiation. When choosing the theme park that you want to visit with your family it is better look for the fun for everyone and then check the details.All of the are very diferrent on the Theme but at the same time they coincide onthe typo of attractions, which means you will find some roller coasters, some shows, some simulations, some character meeting, etc. 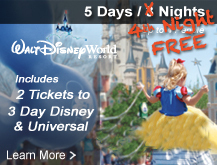 Visit http://www.orlandodiscountticketsusa.com to discover discounted vacation packages or admission for Magic Kingdom, Animal Kingdom, Epcot and Hollywood Studios at Discounted price. On Discovery River the new section for Disney Animal Kingdom will experience what followers of the parks might consider a “memorable and emotionally show in Animal Kingdom history. Originally spected for the Spring 2016 “Rivers of Light” and with delayss Disney finally announced that is ready and it has a date for the very wished show that will be initiaring performance on February 17, 2017. The characteristics of the show like feature water, mist screens, floating lanterns, colorful incandescent lights and off course live performers. “Rivers of Lights” might be consider a ceremony in which animal spirit celebrate their presence on earth and create a “celebration of beauty”. You can not miss a visit to Animal Kingdom on next dream vacation and with Orlando Discount Tickets USA will be affordable for you starting with vacation packages on $169 including 4 days and 3 night accommodation plus the admission for one day at Animal Kingdom for the first couple. Dramatic dance of water and light to recreate the spirit of animal using lantern vessels. The tree of life will blossom with enchanted animations. Because just participating can really reveal the emotions and beauty of the show don’t miss this coming Feburary 17, 2017, a visit to Animal Kingdom and check vacation packages at discounted Price visiting www.orlandodiscountticketsusa.com. Tree Trek is the new Eco-Adventure in Orlando, where all kind of attractions make the Florida a great place for a dream vacation, specially for families that wants to enjoy every day on something different for their ordinary life. Besides the most popular theme park in Orlando Magic Kingdom, Universal Studios, Epcot, Animal Kingdom and Seaworld there are a smaller places for entertainment that doesn’t cost what the park cost and that do not require expend the entire day. Orlando Discount Tickets USA informs you about new ways of entertainment and allows families to travel with an affordable price on their discounted vacations deals with hotel accommodation and also with admission for the Theme Parks. A new aerial experience is available now in Orlando for the most advetoruous, Tree Trek Eco Park a new Eco-Park located on Disney Area is an adventure that incorporated several elevated obstacles courses securely suspended on specially designed poles of about 10 to 60 poles. The new Tree Trek includes zip lines, suspended bridges, nets and much more. Of course in a Eco-Park like this one safety is a priority and the equipment utilized is the best on the market and with the standar to bring the most secure and fun experience. Tree Trek has about 400 parks around the world, and when guest arrive receive off course a demonstration by trained instructors before beginning the course. Tree Trek is a great option for those that love adrenaline and for those that off course wants to break the routine of the theme parks while visiting Orlando. Check great deals on discounted vacation packages by visiting Orlando Discount Tickets USA. Valentine’s Day at the Theme Park is a great an impressive way to spend with a romantic date, but the admission per person at least for Magic Kingdom one day over $100 dollars, and how much would it cost a getaway for an admission for one Day at Magic Kingdom or Universal Studios with just 3 night stay? Well that is about $500 dollars or more depends on the characteristics of the Hotel. Excitement, adventure and even romanticism are possible without spending so much at any of the Theme Parks even if you don’t have an extensive budget for this day that on 2016 is a weekend. With Orlando Discount Tickets USA if you already have hotel accommodation you can get admission for the theme park of your choice for only $29 dollars per person by attending one of our resort preview or on the same way you can book a hotel that starts at $169 for a getaway for 4 days and 3 nights and admission for 2 adults. Just visiting the theme park has diverse and exclusive entertaiment, roller coasters, parades, live show, fireworks, etc will make it unforgettable if you are next to the person you love. Visit Magic Kingdom and get a private view of the fireworks with and extra dessert party reservations. Pass by Disney Spring and have a romantic dinner at the Boat House. Make reservations for the Orlando Eye Observatory for an incredible view of the colorful sunsets of Orlando. Visit the Chocolate Factory and share some chocolates with the person you love. Choose visit Disney Epcot which is a travel for about 12 nations in one day. A unique experience immerse on the culture and gastronomy of well know countries around the world. Walk I-Drive 360 to enjoy a promenade of good restaurants and night clubs. Visit www.orlandodiscounticketsusa.com to discover exciting offers for your next valentine of spring break getaway in Orlando at really discounted prices.